This turn of events certainly impacts the lives of financial advisors and their relationship with clients. Spectrem research shows that most of today’s investors expect return communication from requests for information the same day the request is made, and often within just a few hours. Thanks to technology, advisors no longer have any down time. They must be quickly responsive at all times. Spectrem’s quarterly wealth segmentation series study Using Social Media and Mobile Technology in Financial Decisions displays the research on how affluent investors use social media as well as their smartphone or tablets to communicate with their advisor. "Conversations" are no longer limited to voice-to-voice, the written word or even email communiques. Investors want to be able to reach their advisor in a wide variety of manners. "Some investors are more patient than others, but many of today’s affluent investors want immediate access to information and advice, and this puts advisors in a position to be available for communication at all times," said Spectrem president George H. Walper Jr. "Our research shows that both social media and texting capabilities have altered communication expectations dramatically." For instance, outside of traditional modes of communication, texting is the new favored communication tool. According to the Spectrem study, 16 percent of Millionaire investors with a net worth between $1 million and $5 million have had "conversations" with advisors via texting. 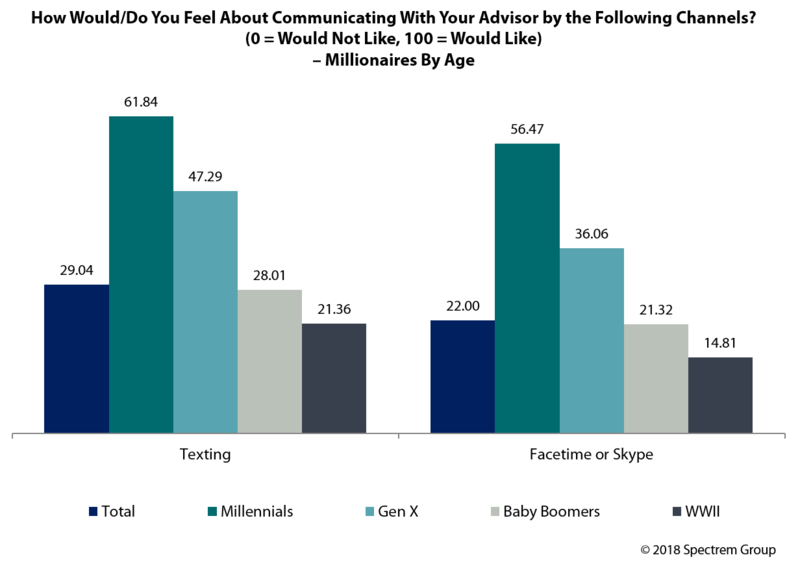 Of that same group, when asked to place their interest in having texting as a way to communicate with advisors on a 0-to-100 scale, the response was 29.04. That is low, but remains consistent from the previous year’s findings. Millionaire investors have not yet extended their communication to social media posts, for that most part. Only 3 percent of investors have communicated with their advisor via Facebook, and only 1 percent have done so via Twitter. Again, however, 37 percent of Millennial Millionaires have reached out to their advisor via Facebook and 21 percent have done so on Twitter. The holdbacks are Baby Boomers and older investors.